Backed by Adelaide Airport, Australia’s fastest-growing capital city airport for three years in a row, Airport Business District is set to become the location of choice for businesses wanting to operate on an international stage. 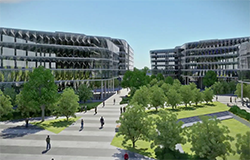 This section contains information regarding the development of Airport Business District into the business gateway between the world and South Australia. Use the navigation shown to access specific information that pertain to the development of this area into a connected and seamless next generation hub where professionals of the future can work, shop and play.